On September 13-14, prudsys AG will introduce its personalization software RDE 4.0 including numerous highlights at dmexco. Among other things, visitors will have the chance to experience the new campaign manager, live at the prudsys omnichannel hub. Personalization management by way of campaigns: Campaign management in terms of time while taking conditions into account. Retailer can implement several personalization campaigns in parallel. Ease of use: The new web interface featuring an integrated operating concept means it is easy to configure the recommendation logic, e.g. product-, user-or category-related. The new dashboard gives users a quick overview of key indicators such as conversion or revenue from recommendations. Clear statistics provide a detailed evaluation. Flexibility: Combinable recommendation logic, more dynamics through the web shop and free choice of fallbacks make grained personalization design possible. The prudsys RDE 4.0 will be introduced as part of the prudsys omnichannel hub. Our showroom, the omnichannel hub, provides a variety of different application scenarios for real time personalization to test and try. Many of the Top 100 mail-order businesses use the prudsys RDE for business cases in the fields of recommendations, marketing automation and dynamic pricing. With its help, retailers can offer their customers an individual shopping experience across all channels throughout the entire customer journey. 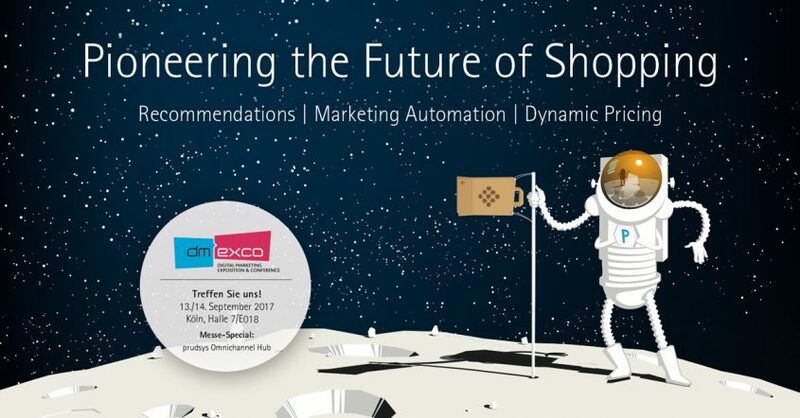 The motto of this year’s dmexco 2017 is “Lightening the Age of Transformation”. More than 500 top speakers and industry influencers will address the most important topics of the digital economy. With over 50,000 visitors, dmexco is one of the leading trade shows in the world of digital marketing. Secure your spot with prudsys ahead of time at prudsys.de/en/events.